When it's time to build, you need a contractor who can give you quality at an affordable price. You need honesty and transparency at every step of the process. you need a company committed to keeping your project on schedule. You need Phillips, Inc. Licensed in Alabama, Florida, and Georgia, Montgomery, AL based Phillips, Inc. works to stay within your budget for your residential or commercial building while exceeding your expectations. Phillips, Inc. specializes in providing custom formed concrete work. 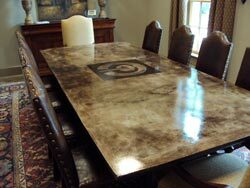 Our unique board-room tables, counters, and other pieces can are all completely custom made. Find out more about these special formations.